Coming Home. Alumnus Ian Clark and his wife, Jessica (also an alum!) joined Dr. Vigor Yang for some reminiscing during the 2015 CoE Alumni Awards Gala. Check out the slideshow. 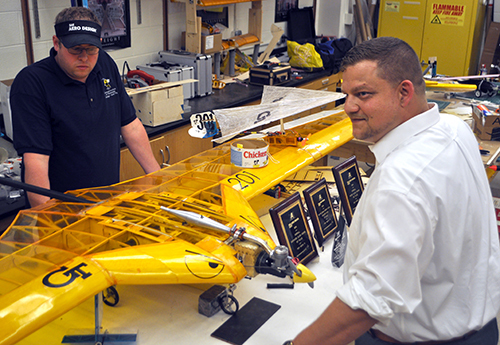 With more than 6,000 alumni, the Daniel Guggenheim School of Aerospace Engineering knows that there's a lot of exciting AE news out there. Career advancements. Career switches. Business successes. Research breakthroughs. Additional degrees. Awards. What's yours? Did you host an AE student as an intern or a co-op? Send your photos! Is AE having an impact in your industry? Let us know! Our Distinguished Lecture series hosts many industry experts and thought leaders. Attend one. We are always looking for accomplished alumni to address our students - in classes, in public lectures, or symposia. Ask us about it! Recruit up-and-coming aerospace engineers at one of our career events...or mentor an AE student who is entering the workforce. Join us for the Brown Bag Lunch series -- every Friday during the academic year -- to hear about the research our students are doing. Be an expert judge for our annual Capstone Design Competition - one of the most revered in the nation. Check out our AE Calendar to find out what's going on at your alma mater. And consider yourself invited. QUESTIONS? Contact AE Development Director Farah A. Kashlan. Each year, the College of Engineering at Georgia Tech celebrates alumni who personify the diligence, vision, and achievement that are the pillars of the Institute's legacy. In 2017, two AE alums were among the honorees at the CoE's annual banquet: Al West, who was inducted into the Georgia Tech Engineering Hall of Fame, and Andrew Ollikainen, who was named to the Academy of Distinguished Engineers. 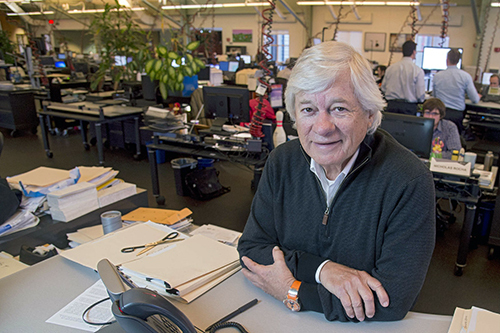 Alfred West is the chairman and CEO of SEI Investments, a global provider of investment processing, investment management, and investment operations solutions that he founded in 1968. After earning a bachelor’s degree in aerospace engineering from Georgia Tech in 1964, he earned an MBA from the Wharton School of the University of Pennsylvania. In 2010, he was selected to receive one of the most prestigious honors bestowed by Georgia Tech - an honorary doctorate. His company helps corporations, banks, financial advisors, retirement plan sponsors, and affluent families create and manage wealth. SEI currently administers over $751 billion in mutual fund and pooled assets, including $281 billion in assets under management and $470 billion in client assets under administration. 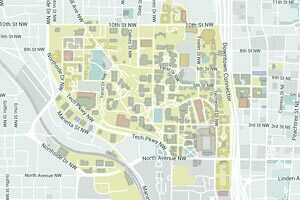 West chaired the quiet phase of the recent $1.8 billion Campaign Georgia Tech. He is a trustee emeritus of the Georgia Tech Foundation and the Georgia Tech Advisory Board, and served as fund chair for the Class of 1964 50th Reunion Committee. He also served on the National Campaign Steering Committee for the Campaign for Georgia Tech, which concluded in 2000. In 2006, West received the Alumni Association’s Joseph Mayo Pettit Distinguished Service Award. Andrew C. Ollikainen is a senior structural integrity engineer for Northrop Grumman Corporation. He earned his bachelor's degree in aerospace engineering from Georgia Tech in 2007. He went on to earn a master’s degree in mechanical engineering from Mercer University, a second master’s degree in military science from the Air Command and Staff College, and a graduate certificate in composites from UCLA. As a senior structural integrity engineer at the Northrop Grumman Corporation’s manned aircraft design center of excellence in Florida, he is currently pursuing his doctoral degree at the Florida Institute of Technology. Ollikainen has dedicated his career to the safety of service men and women flying into harm’s way. 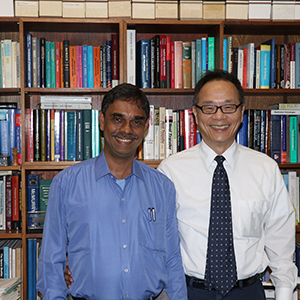 His current work and research are in the methods of determining the airworthiness of composite aircraft structures. He previously served in the Air Force Civilian Service, managing the C-17 Globemaster III aircraft structural integrity program. During his service, Andrew received the Air Force civilian achievement award, the Air Force civilian command award for valor, and the Air Force Material Command technology and engineering management award. Ever appreciative for the impact Georgia Tech has had on their lives, Andrew and his wife, Stephanie, have entrusted their legacy to the Daniel Guggenheim School of Aerospace Engineering.